We have an inner circulation of energy (Qi) that flows continually around our body through what we know as the meridian system. This system is impacted on by our external environment. Acupuncture works with this system to restore the balance in the body. When we disrupt the flow of our energy by either internal or external conditions, the balance within our system becomes disrupted. The harmony can be lost, eventually resulting in disease. Acupuncture can help to prevent and cure a wide variety of conditions. 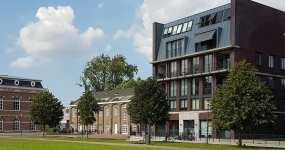 In the summer of 2017 my practice is moving to a new location: Sint Jorisveld 1 in Haarlem. Traditional Chinese Medicine has been developed over the years by thousands of practitioners, each adding to what came before. Today, this gives us a complex, dynamic and holistic system in which to solve the complaints of our physical, emotional and mental makeup. With acupuncture and TCM a variety of complaints can be cured. Traditionally TCM was strongly focussed on prevention, where modern medicine mainly focuses on curative healthcare. In my work I like to combine the two, and will always be looking at possibilities where simple lifestyle changes might help my patients to maintain a better health and energy level for themselves. As I strongly believe in taking time and attention for my patients, a treatment takes between an hour to an hour and a half. Most health insurances cover (part of) the costs of the treatment, based on the additional healthcare plan. I use a variety of techniques mainly focussed around the Jananese stype of acupuncture of Kiiko Matsumoto. 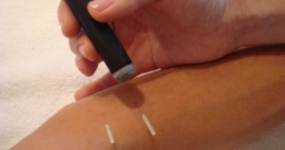 Needles and moxibustion are commonly used. In case of a fear of needles, the treatment can be adjusted. Since september 2017 I have moved to a new location. In our light and quiet practise, it is easy to relax and take a moment to let the stress of daily life go for a while. 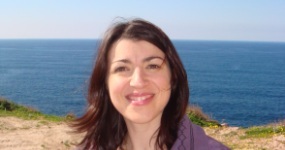 Giulia has over ten years of experience in the health and wellbeing sector. She started with remedial massage and lymfedrainage in Sydney, Australia. She trained in Amsterdam to become a TCM practicioner.